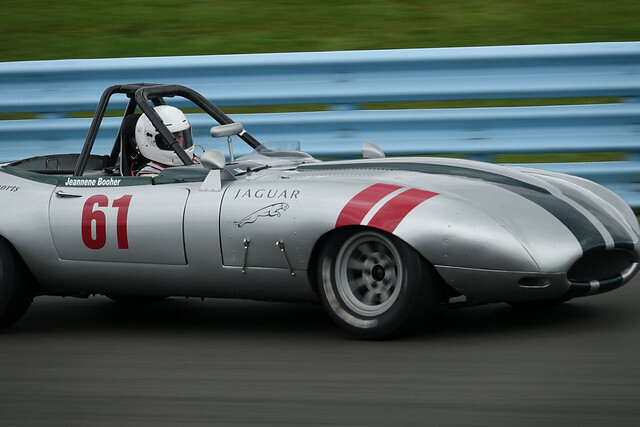 I am quite the car nut, so when I had the chance to watch vintage car racing at Watkins Glen race track in upstate New York, I cleared out my calendar. Naturally, I would bring a camera - but I did not make the obvious choice of a pro-level DSLR with a gaggle of lenses. Instead, I chose the decidedly consumer-level Sony Cyber-shot RX10 III, an all-in-one superzoom camera. The Sony, on the left, weighs 2.2 lbs. The Nikon kit, comprising a prosumer-level D7200 body, 16-80 mm lens, and 80-400 mm lens, weighs over 6 lbs. The big zoom alone is 3.5 lbs. (Had I chosen a full-frame camera, the weight difference would have been even greater.) Plus - and this is a big factor, in my opinion - I can access the Sony's entire zoom range by toggling one switch, instead of having to swap lenses. So how did the RX10 III stack up? Pretty decently, I'd say. Image quality was surprisingly good. I shot JPGs, no RAWs, and was happy with the colors. I set exposure compensation to -1/3 or -2/3 EV and also used zebra to monitor my exposure. (More cameras should offer zebra in their live view. Hello, Fujifilm?) I set ISO and white balance to Auto. Otherwise, the images are straight out of the camera other than slight boosts to brightness in Lightroom. Autofocus could not quite keep with the fast-moving cars. I tried a few AF modes, but had the best luck with single-shot mode using a center focus point. On continuous focus, the RX10 III has an annoying habit of racking out to the near distances instead of infinity when it loses focus. I didn't have time to experiment with tracking or other AF features. I've used other Sony cameras before and am aware of their quirky menus. The RX10 III is no different. Things like EVF settings are scattered across different pages in a haphazard way. I changed a few settings, like assigning the custom buttons (ISO mapped to C1 and drive mode to C2), and that was enough for me. Bottom line: no, I would not choose the RX10 III for a sport-specific assignment. But for pleasure, the Sony did quite well and I'm happy with the pictures. Here's the Flickr gallery, complete with camera metadata for all your viewing pleasure. Postscript: Wouldn't you know it - Sony just announced the Cyber-shot RX10 IV, with improvements to the AF. Can't wait to try this out.